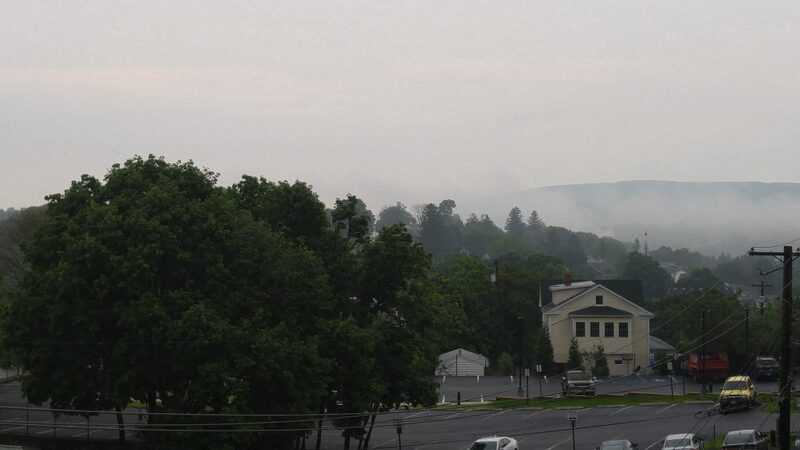 The old hotel in downtown Frostburg was a step back in time. It helped that there was a museum integrated into various parts of the building. Except for the warm showers homes, it was the first and last night that Hidalgo and I would sleep apart. He was secured in a special storage area in the rear. He needed some lubrication after the hosing he got last night. With that task completed, we were ready to hit the road. I made an extra PBJ sandwich from a bagel to have on the road later, along with some milk I bought last night. Since today was going to be another trail day, I knew the food opportunities would be few and far between. The extra PBJ on a bagel was appreciated later down the road. Yesterday had been a race against the rain. The faster I went, the better my odds of staying dry. I had won through determination and a lot of luck. Today, I knew I wasn’t going to be so lucky. I was going to get wet, it was just a question of where and for how long. I almost put on my best rain jacket at the start as there had been some mist when I stepped onto the hotel balcony. Things were better when I got on the trail, so I packed it up. The jacket soon came off. I knew I would be going downhill at the start. The Allegheny Passage Trail was running adjacent to the railroad tracks and was packed so firm, it was almost like pavement. I was holding 17 mph and made quick time to Cumberland. 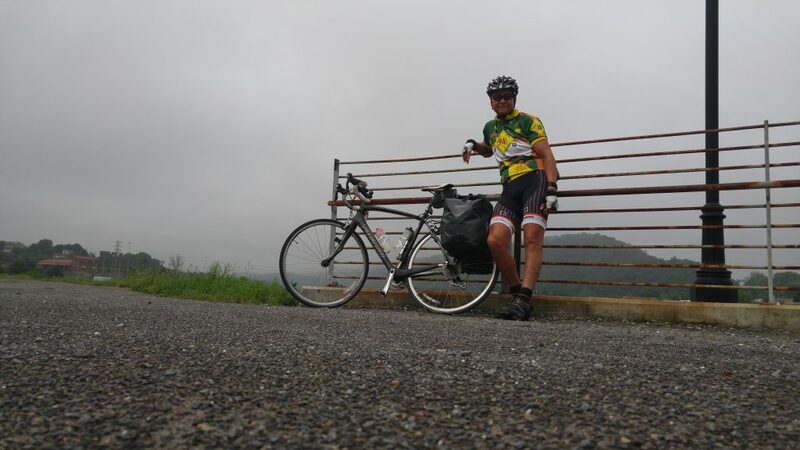 Along the way, I was riding in the clouds as the rain clouds hovered almost at eye level. The views were spectacular and I was staying dry. For a few seconds I was racing with a white tail deer leaping just ahead of me. Heaven. By the time I arrived in Cumberland, the trail had leveled out and I had to cross a few streets in the town. If the rain hadn’t looked so close, I would have taken my time and gone for second breakfast. 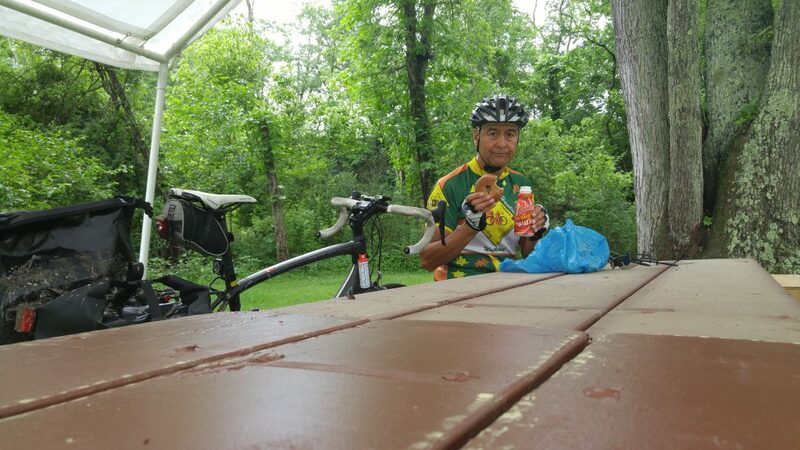 As I left town, I discovered the difference between the Great Allegheny Passage and the C&O Towpath trail. 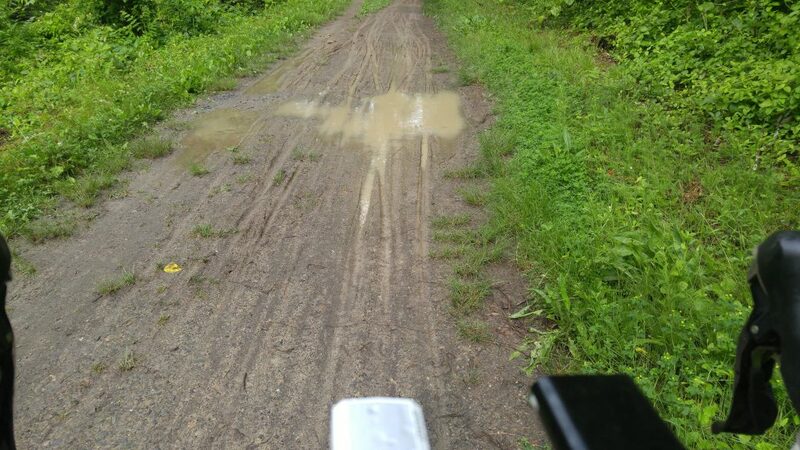 I had encountered a half dozen puddles in my first 16 miles. I was riding through half a dozen puddles in the next 200 yards. At first, I would try not to splash by braking or gliding slowly through the muddy water. 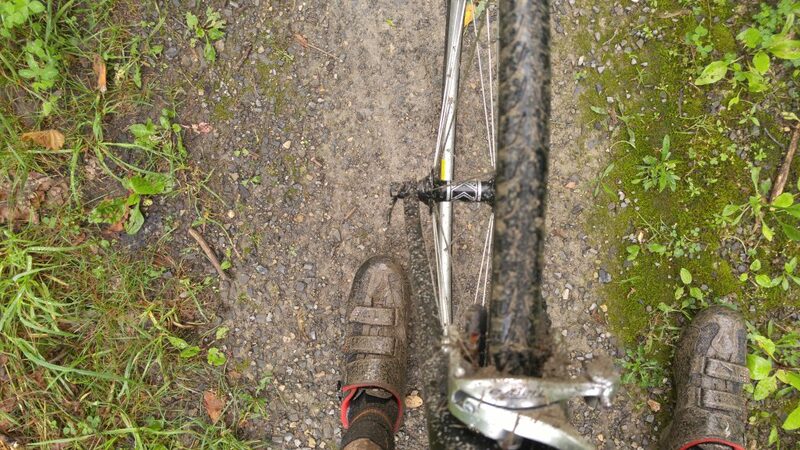 However, there were just so many ruts with water that I finally decided to ride and pedal through the water. I was already getting wet and muddy. Hidalgo wasn’t looking too good, either. Over the next 27 miles it was unsure rolling, mud, grassy patches, loose ground, and lots of puddles. 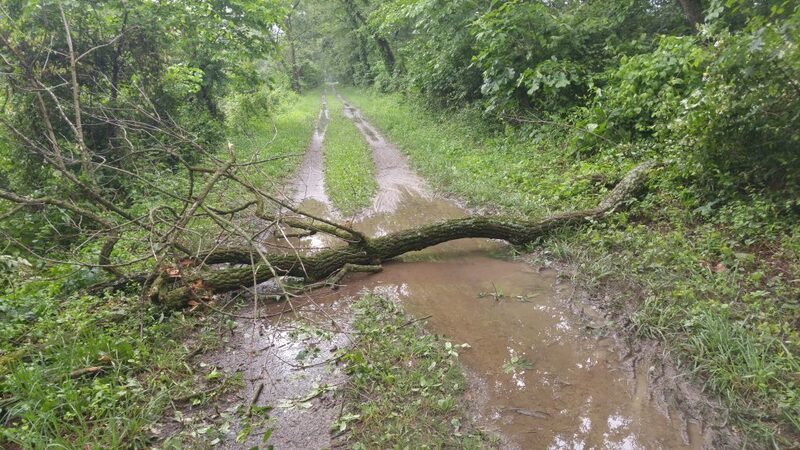 Sometimes the path was blocked by fallen branches from the recent storms. It was no place for a road bike with skinny tires. I had one or two opportunities to try and get on a real road, but there were still trade offs to that decision. While the trail was rough and muddy, it was flat. I had already caught some light rain and the trees protected me from most of it. There had been portable potties and water pumps at regular intervals. My cell coverage was gone. The GPS could tell me where I was on the trail and a rough scale to gage the distance to the next town. It could not give me directions or show any details of roads or alternatives. I had a pdf file on my phone with the route, but it didn’t have much detail of the surrounding area. Bottom line was that I wasn’t going to get much direction if I wanted to get off the path. I could see that a major road crossed the trail near Paw Paw, WV. I had had enough, and even if I had to climb up over a bridge, I was getting off this trail. Besides the puddles and mud, I had two close encounters with a pair of geese and their chicks. After falling yesterday, I just charged through them, the puddles, and the mud. I thought I was going to run over a chick and the parents almost caught me, hissing the entire time. As I got closer to MD 51, I kept checking my phone and the map scale to estimate how much farther. I swear I was within a mile for 2 mIles and then within 2000 feet for 5000 feet of riding. I was not going to miss this road. It finally appeared before me, or rather, above me. I took the ramp up to the pavement and Hidalgo was finally reunited with a real road. Just a half mile earlier, we had come to a porta potty and a water pump. I did my output, the water bottles did their input. 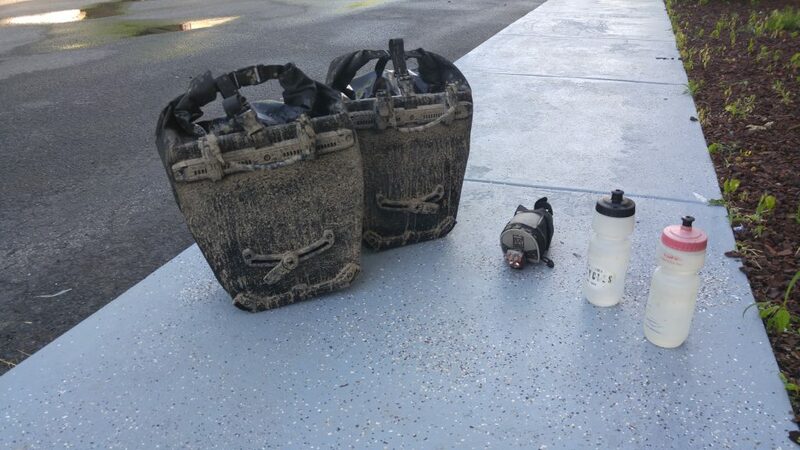 While I had access to a good supply of water, I emptied both bottles a couple of times trying to squirting the mud that had caked up on Hidalgo’s brakes, derailleurs, and rear cluster. 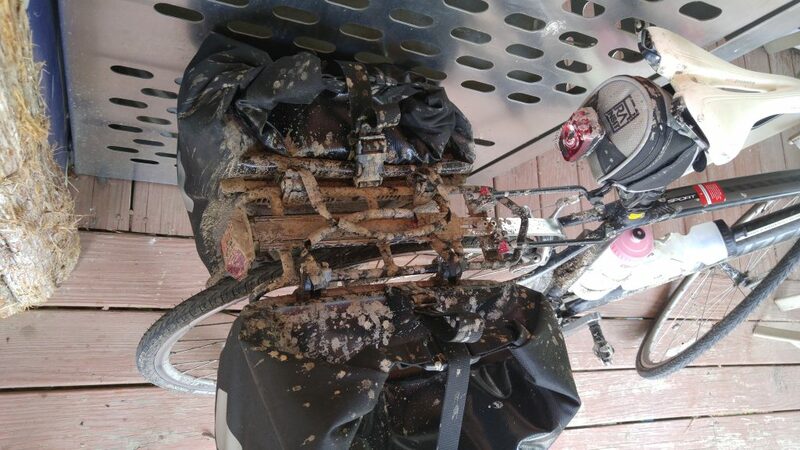 The poor bike had never been so dirty. Within two miles of being on the road, I encountered my first big hill. It went at least a half mile and I was using my lowest gears. The dirt was making Hidalgo shift erratically, jumping a gear long after shifting. The trail was still haunting us. The next 30 miles were a series of climbs, followed by downhills of over 30 mph. The sun had broken through and I was dripping sweat to the pavement when I was in the low position climbing for all I was worth. As hard as it was, I was still happy to be off the trail. While I hadn’t gotten much rain from above, the soaking I got from below was equally miserable. 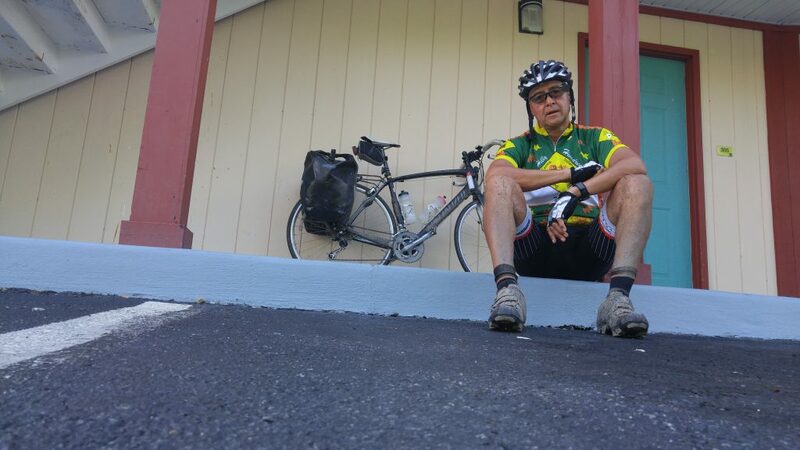 After an especially long climb, with switchbacks, I knew I was getting close to Berkeley Springs. 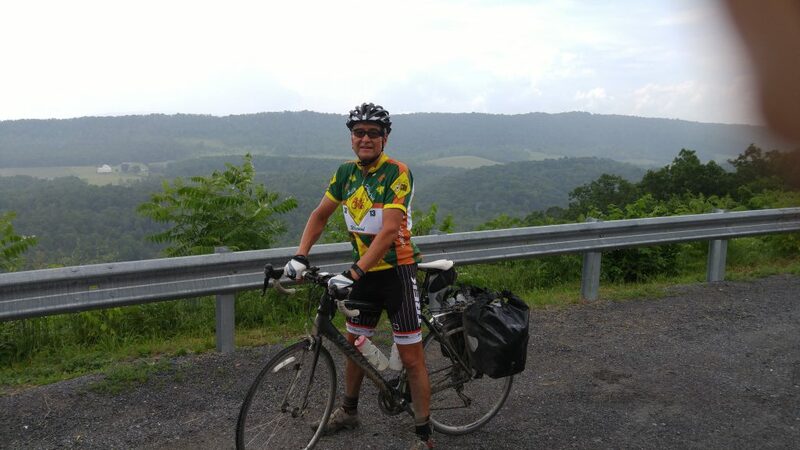 As I reached a peak, I stopped to admire the view, asked someone to take my picture and also asked him how much farther to Berkeley Springs. The man told me I was only 2 miles away and that Hancock, my destination was only 5 miles farther. He also said it was pretty flat between the two. My spirits were lifted, in spite of the light rain that had started. 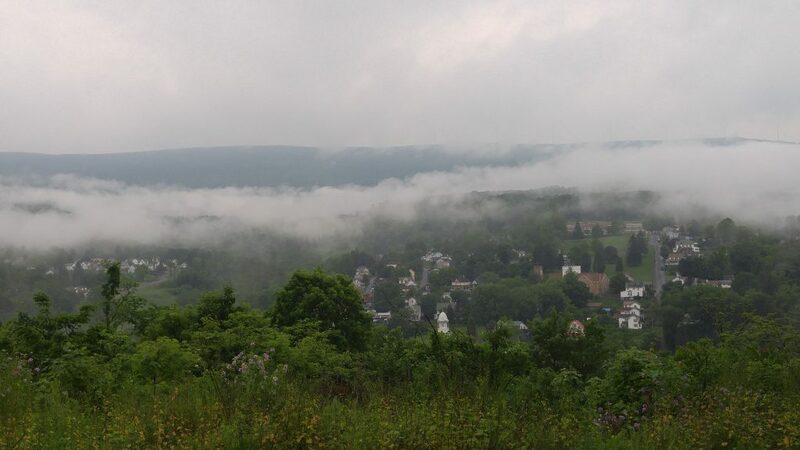 The rain stopped, but there were a few more hills before I hit the relatively flat run to Hancock. 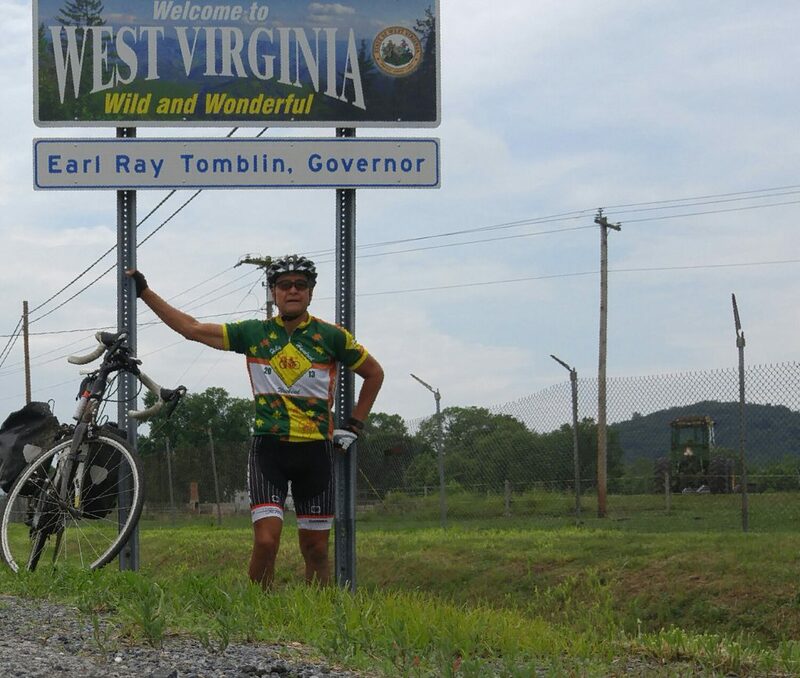 When I had jumped off the trail in Paw Paw, I had crossed a bridge over the Potomac River into WV. As I made my way back north into Maryland, I would again cross the river. This time, it was at a point where it was much wider. I would estimate that the bridge went about a third to half a mile. When I made my run, the traffic was clear. It was one lane each way, with no divider on US 522. 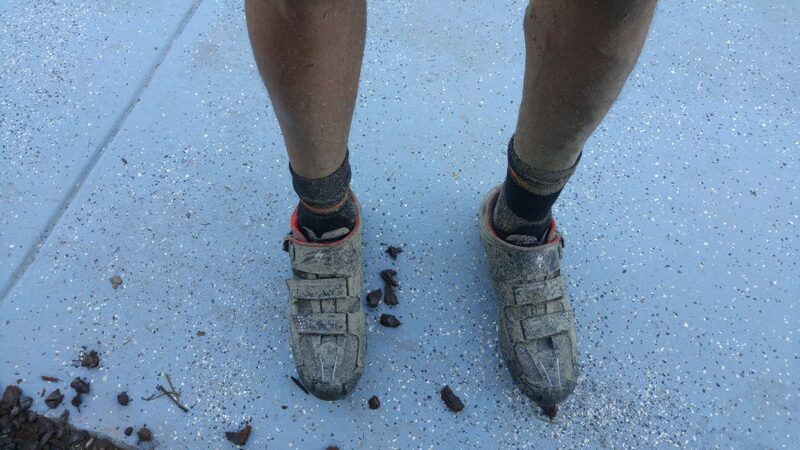 I was going as fast as I could after 75 miles of puddles, mud, and steep hills. I was 3/4 of the way across when I saw a semi in my rear view mirror. There was no place to pull out or over. The white stripe was less than a foot from the concrete barrier to my right. I pedaled for all I was worth. The semi didn’t seem to be cutting me any slack, even though I had less than a hundred yards to the end of the bridge, where I could pull over, he kept coming, closing the gap. I made it across just as he was passing me, avoided a grate in my path and jumped over an entrance to a restaurant. His back draft blew a gust in my face. Nearly every trucker has been great. I guess 5 PM on a Friday night was the wrong time to be in front of him. When I checked into the hotel, I filled the waste can with water and was ready to give Hidalgo a bath. Fortunately, there was a hose on the outside of the building used to water the landscaping. 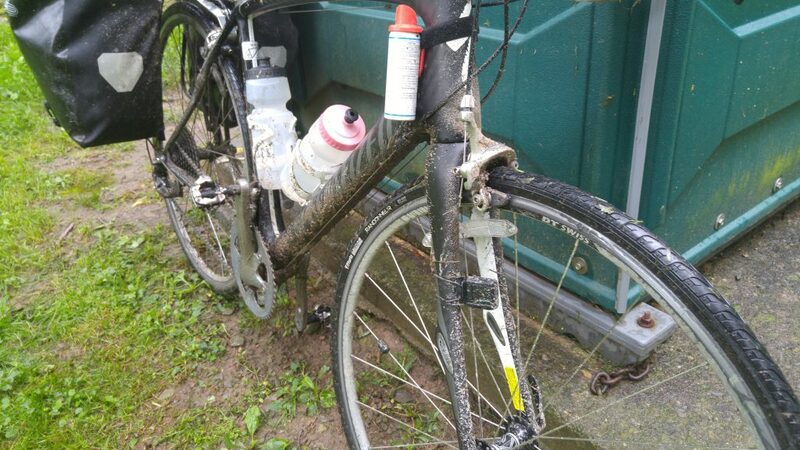 I borrowed it long enough to spray off the mud and road debris off the poor bike. It had never been so dirty. Then it was my turn. Ready to check in to the hotel. 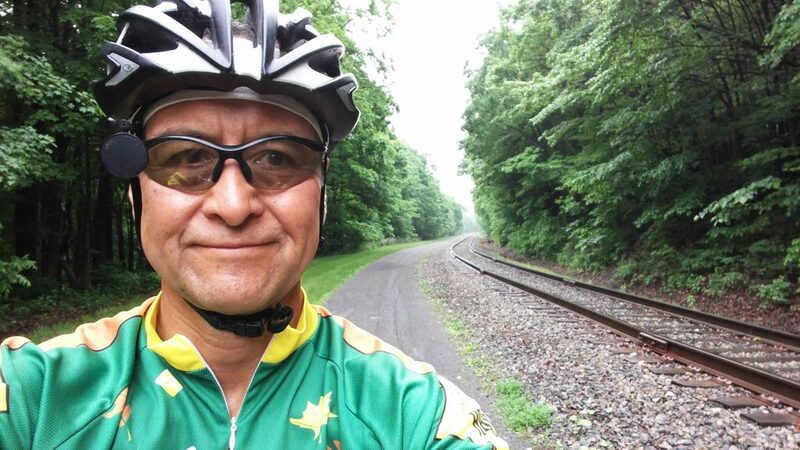 Tomorrow’s plan had me back on a trail for part of the ride to Damascus. If it’s not paved, I will already have an alternate road route marked, planned and written down or printed! It will be my last night before I reach the Chesapeake Bay. Tomorrow Becky will meet me for the final run on Sunday.